Arne jest kolejnym z kolekcjonerów o ustalonej specjalizacji – Pectinidae frapują Go od 15 lat, jednak, co niejednokrotnie podkreślał, są ciągłym wyzwaniem i źródłem niespodzianek systematycznych. Wszystko za sprawą nieokiełznanej rozrzutności natury – „malującej” je w najróżniejsze wzory. Arne Ghys przy swoich zbiorach. ” I was born in June 1972 in the city of Oudenaarde, in the Flemish part of Belgium. Since my very early childhood I have been fascinated by all aspects of nature, such as flowers, birds, butterflies and other creatures. My father, who is an active stamp collector , often exchanged stamps with Maria Poppe. She is the mother of Guido Poppe and lived in the same village as me. Whenever my father visited her, I could always accompany him. 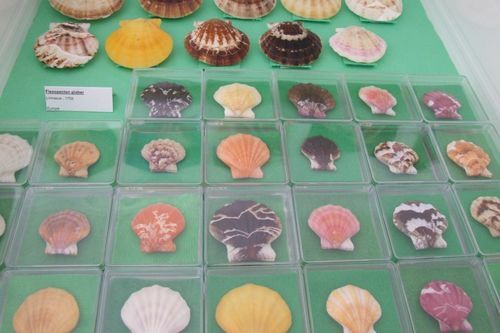 There I saw for the first time how beautiful seashells were. 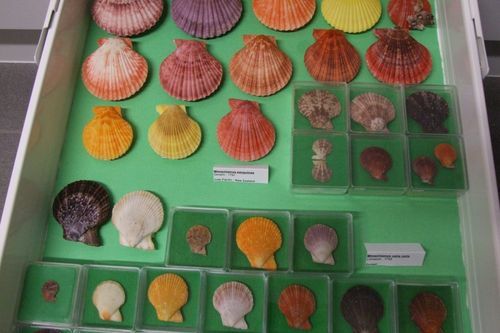 As a little boy I was amazed at how these animals could make such nicely colored seashells of different shapes and forms. 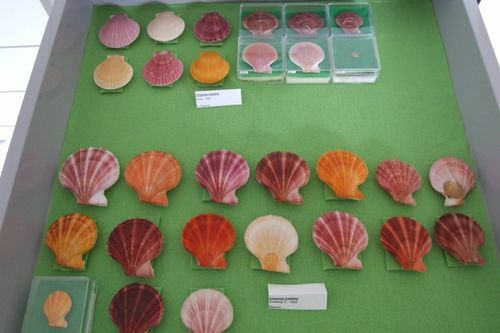 Every time we visited her she gave me a few shells and this was the start of my fascination with shells. 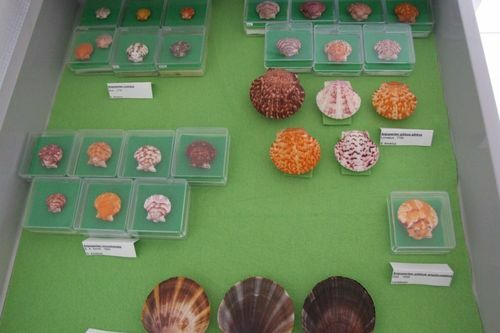 With my pocket money I could purchase some of the more common shells and all of our friends were asked to search for shells on their holidays. After some years I realized it would be too much to collect all families so I had to fix my mind on one particular family. Because of my never ending fascination with colors and forms it was obvious that Pectinidae was on top of my list of interests. 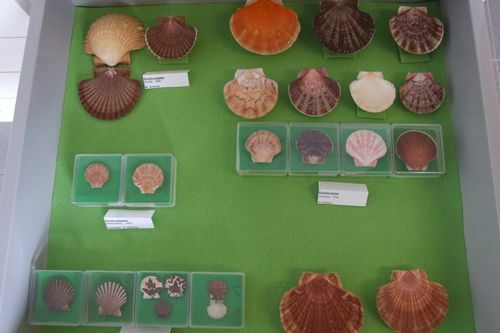 Even in the colder waters of Europe, where mostly white and grey shells can be found, there is no other family like the Pectinidae. 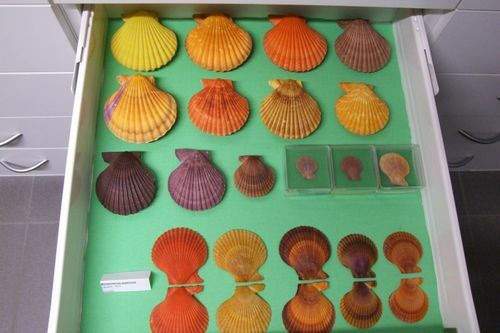 Think of the color variations of Mimachlamys varia varia, Pecten maximus and last but not least Flexopecten glaber. 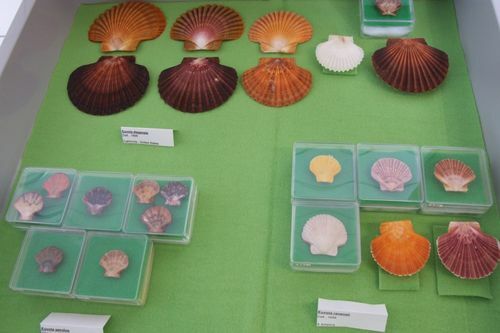 My interest in Pectinidae never stopped. 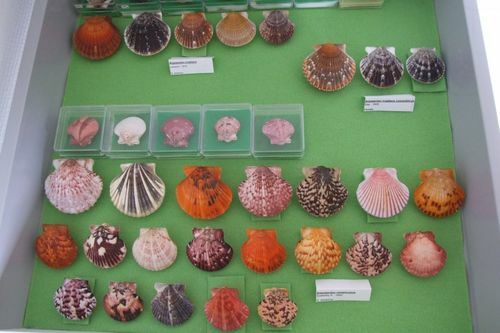 After 15 years of collecting pectens, I have about 230 different species and about 3000 shells. 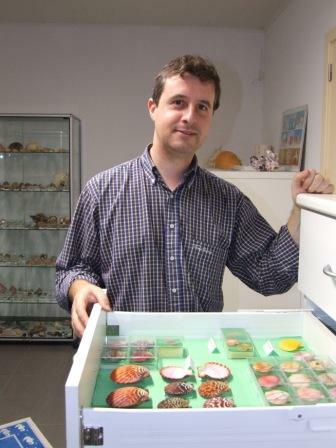 I am always interested in acquiring rare or uncommon species, other color forms or species from other localities. All kind of information, articles and books are likewise always welcome. A oto kilka ujęć prosto z szuflad kolekcjonerskich Arne? U góry, kalifornijskie Euvola diegensis. U dołu, po lewej – Euvola perulus; a po prawej, południowoamerykańskie – Euvola ravenelli. A tutaj gatunki kanadyjskie. U góry – Chlamys rubiola; a poniżej – Chlamys hastata. U góry, nowozelandzkie – Mimachlamys sanguinea; a u dołu, europejskie – Mimachlamys varia. Kolorowe, australijskie – Mimachlamys asperrima. Patrząc od góry: północnoamerykańskie – Argopecten irradians; florydzkie – Argopecten concentricus i południowoamerykańskie – Argopecten ventricosus. A tutaj, niepozorne, głównie brazylijskie gatunki – Argopecten nucleus, A. gibbus gibbus, A. gibbus amplicostatus, A. noronhensis. W kolejnej szufladzie, ponownie brazylijskie – Euvola ziczac, E. vodgesi, E. chazaliei. 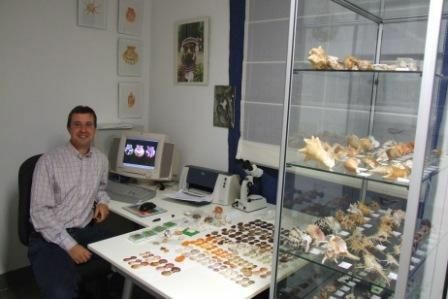 Oto Arne Ghys w swoim pokoju kolekcjonerskim i przy stanowisku komputerowym, gdzie powstaje wartościowa merytorycznie witryna internetowa – „PECTEN SITE”.